The Noises at Old Red Lion Theatre. Photo: Ali Wright. I’m a dog person. I’ve met many dogs, pointed at many more dogs and I consider my own dog, Dennis, to be my favourite family member by a considerable margin. When I saw The Curious Incident of the Dog in the Night-Time last month, my only note was that the puppy from the final scene should have appeared in all of the previous scenes too – it’s just good dramaturgy. Dogs are, to borrow a portmanteau from my secondary school pencil case, totally pawsome. The Noises at the Old Red Lion is a show that will delight dog people, particularly those of us who have always suspected (known) that behind the quizzical eyes of our companions lie very human thoughts and feelings. 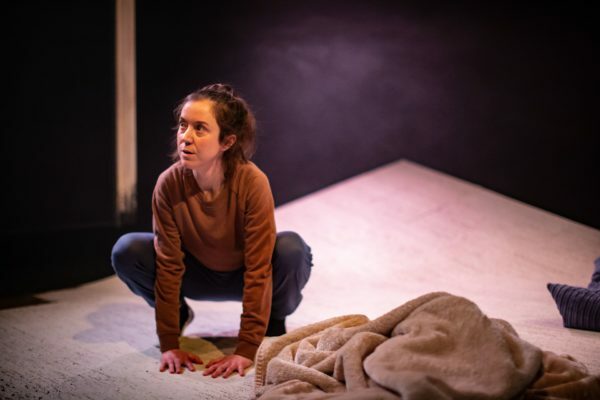 In Jaqueline Saphra’s play, this theory is realised in the form of Luna (Amy McAllister), a family pooch whose peculiar vocabulary and simple syntax will be recognisable to anyone who’s acted out a conversation with their pet. She’s a good girl in a bad situation, left home alone by parents too pre-occupied with the disappearance of their teenage daughter to act on their responsibility for the other living being in their care. McAllister is as inherently likeable as the animal she portrays, her embodiment of canine behaviour as amusing to observe as the real thing. Dogs are natural clowns, and so adopting their recognisable mannerisms (be it head-cocked alert dog, or tail-wagging playful dog) produces a clownish blend of hilarious silliness and melancholy empathy. Like Jack, the child narrator from Emma Donoghue’s Room, Luna’s restricted worldview means she reinterprets the familiar, exposing deeper truths about our relationships with animals that correspond sweetly with, or mirror discomfortingly, our relationships with one another. When she is admonished for gorging on a chicken, Luna’s defence is Forrest Gump-like in its witless wisdom: why wouldn’t I eat it? After all, it was on the table, right by my mouth. Indeed Luna, indeed. If only my flatmates would learn this simple rule about mouth proximity, they would find living with me far less stressful and costly. Georgia de Grey’s warped set plays a trick of perspective so that, in combination with Timothy Kelly’s eerie lighting, Luna exists vulnerably in an environment too big for her, created with no consideration for her needs. The titular noises are heard in the form of Tom Parkinson’s immersive sound design: muffled voices, screaming police sirens and persistent, obscure explosions. Simulating the sensory overload of proximity to human civilization, these could just as easily signal fireworks night celebrations or complete societal collapse. It’s a striking observation that, to an animal forced to exist inside of it, human society might feel almost apocalyptic. Luna wants to be good, to do her job, to save her family, but instead she flits between living out her endless imprisonment in the present and reliving the violence and suffering of her past. It all becomes quite bleak, as she persistently attempts to engage with us, make us speak, confirm that we’re really here in the room with her. When we don’t respond she provokes us in any way she can. Quiet sitter in your little corner. She’s done me there, I absolutely am one of those. But crucially, I can choose to leave my little corner, whereas she is completely controlled by the choices of someone like me. A dog person. It is a choice, after all, to own a dog – to accept the subservience, the love. Don’t get me wrong, The Noises is a celebration of all that is great about our relationships with domesticated animals, but as I (make the choice to) exit the theatre I know that the next time I (make the choice to) leave Dennis home alone I’m going to feel awful… totally pawful. The Noises is on at Old Red Lion Theatre till 20th April. More details here.